We understand that starting orthodontic treatment for yourself or your child is a financial investment. 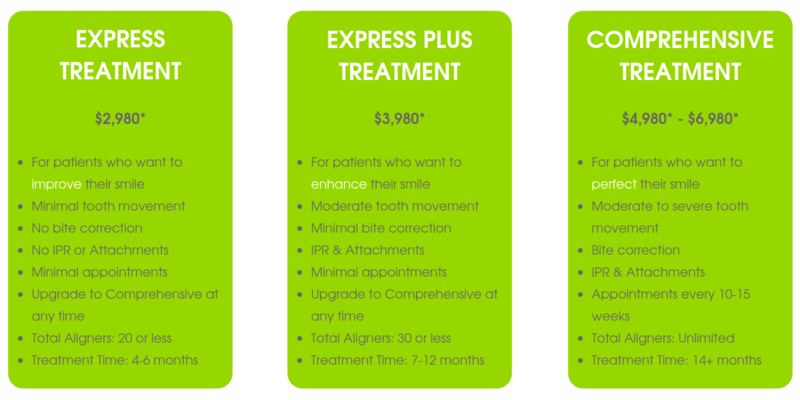 In order to help your prepare for the cost of Invisalign treatment, we are pleased to provide you with an estimated cost. The prices below reflect our average costs. The cost of each person's orthodontic treatment is determined by the complexity of their case and length of treatment. Please be advised that a consultation is required, in order for the Orthodontist to evaluate and provide a final cost. Consultations are always complimentary. * Eligibility and final pricing determined upon doctor examination.